10. April 4 belongs to Martin Luther King, Jr., not militarism. War is a leading contributor to the growing global refugee and climate crises, the basis for the militarization of the police, a top cause of the erosion of civil liberties, and a catalyst for racism and bigotry. A growing coalition is calling for the abolition of NATO, the promotion of peace, the redirection of resources to human and environmental needs, and the demilitarization of our cultures. Instead of celebrating NATO’s 70th anniversary, we’re celebrating peace on April 4, in commemoration of Martin Luther King Jr.’s speech against war on April 4, 1967, as well as his assassination on April 4, 1968. David – What an excellent list of 10 reasons not to love NATO! This should be widely distributed. Might that coalition be interested in holistic fundamental tax reform that addresses all of these concerns and can bring together both the left and the right into common cause? I would love to talk with you about this. I have noted the April 4th Celebrate Peace on my calendar. Pingback: Gorilla Radio with Chris Cook, Dave Lindorff, David Swanson, Janine Bandcroft January 17th, 2019 - Gorilla Radio is dedicated to social justice, the environment, community, and providing a forum for people and issues not covered in the corporate media. One of the more sensible arguments in favor of the NATO is the defense against Russia. However, what NATO proponents forget is that the West could have removed the Soviet threat by letting them join the NATO. Soviet Union wanted to join the NATO in 1954 (there is evidence for that from reputable sources such as “The Guardian” newspaper; write to me if you want the exact sources). Virtually all post-Soviet Russian presidents incl. Vladimir Putin reiterated the request to become a member of the NATO, and thus an ally of the US. In 1954 Western officials did not take the Soviet proposal seriously. 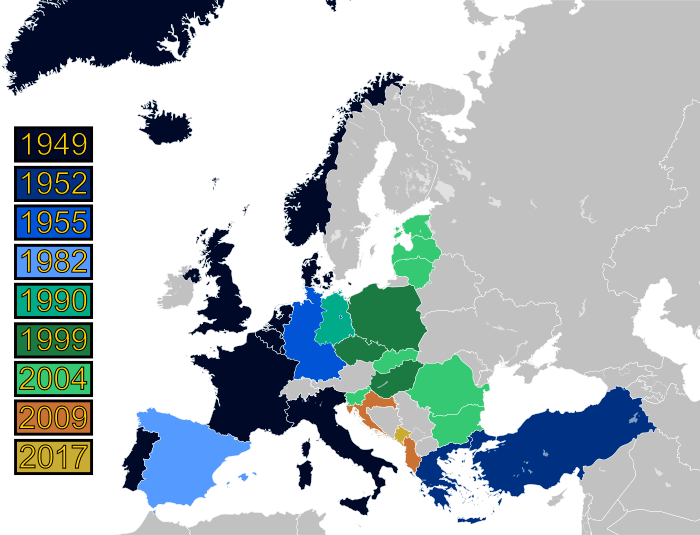 The result was that one year later the Soviet Union created the Warsaw Pact. Had the NATO cooperated with the Soviets, it is reasonable to think that Cold War would have ended in 1954-1955, without a 40-year division of Germany and a host of proxy wars (Vietnam and Afghanistan). Pingback: Has NATO Met Its Match?